My MacBook Pro Retina Display screen didn't like my existing cleaning cloths. All I would get smear instead of clear. In fact the only thing that worked at all was the small cloth Apple included in the kit. So my quest began for a nice, large microfiber cloth that worked on all of my Retina displays, including the MacBook Pro. My salvation was realized at CES. 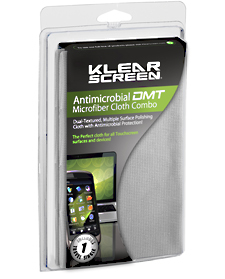 Over at the Klear Screen booth they introduced me to the Klear Screen DMT Antimicrobial Microfiber Cloth for $9.95. Unlike my existing Klear Screen cloths, this one has two distinct textures. That extra "tooth" is what I needed to get the gunk off my super glossy MacBook Pro screen. And the big size is much easier to work with than the small Apple cleaning cloth. The DMT works great on the iPad and iPhone too. As a bonus, the antimicrobial treated cloth is designed to eliminate up to 99 percent of the bacteria inside the cloth after cleaning a surface. I'll take it! I keep the Klear Screen DMT Microfiber Cloth in my backpack and now have shiny, clean screens on all my devices. It's the small things in life that make it better. I've been using this for several years now with excellent results. One word of caution, at least for the iPhone, just one, quick spray not too close to the surface, mist not wet. While my wife and I were in the Apple store getting her iPhone problem resolved a guy next to us was arguing with the iPhone genius and swearing that his phone had never, never gotten wet even though the internal sensor was showing it had. They finally "supposed" that he was using too much cleaning spray but gave him a new phone anyway. I get the feeling the guy must have been bathing his phone in it. Forgot to add they suspected it got in through the speaker grill. This particular cloth I'm talking about doesn't seem to need any spray at all. It has really good "tooth". If anything, I just fog the screen a bit with my breath, and wipe away the smudges. I've been using the standard microfiber cloths you can buy at Costco in bulk. They work great on stainless steel appliances, counter tops, range hoods too - and as Derrick notes, with or even without any liquid (water or household cleaners).